A compelling new actor. A sharp, driven writer. A brilliant veteran actress. Inventive staging in the round. All of it adds up to another successful production from Unity Productions out of Cincinnati. FIXATE by Jon Kovach is everything we’ve come to expect; witty-not-preachy social responsibility, smart humor, and a professionalism to the entire package that is unparalleled. With the exception of some unfortunate technical limitations (the show has a lot of lighting cues; whoever assigned this show to this venue should have re-thought that move), there’s no missteps, no hiccups. This one clicks on all cylinders. 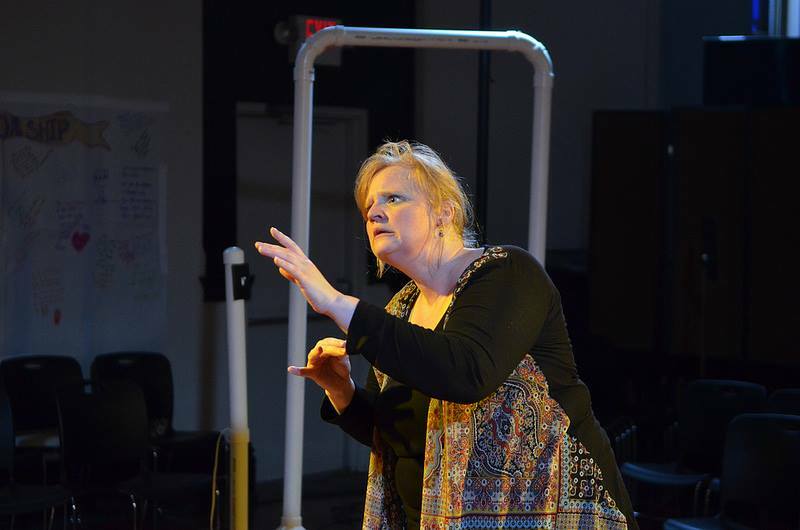 Director Billy Chace has taken Kovach’s script and put it in the hands of Rex Martinez, a recent graduate of NKU, and Sara Mackie, a long time favorite of area theatres. Together they light up the Nast Trinity Church’s upper room with some explosive dialogue, powerful emotion, and interesting fantasy. I enjoyed it, can you tell? This show started as a script inspired by a poem about Obsessive-Compulsive Disorder. It’s turned into an interesting interaction between two strangers with secrets – and yet it still manages to shed light on an important social issue. . . again, without being preachy. I’d love to see what would happen if this script were expanded into a full length play. I think that both of these characters have more to do – and I’m sure Kovach has more to say. FIXATE plays one last time, tomorrow (Saturday, June 6) at 2:45 PM as part of the Cincinnati Fringe Festival. Click here for more information.